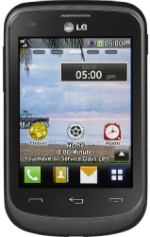 The LG 305C is a basic phone with a 3.2-inch touchscreen display with a resolution of 240x320 and 125ppi density. It has 256MB onboard storage and a microSD card slot for memory expansion of up to 32GB. The phone is equipped with a 2MP camera to take pictures and record videos. Other notable features include its Wi-Fi connectivity, Bluetooth, and M4/T3 hearing aid rating. On the back is a removable Li-Ion 1540mAh battery that helps it last up to 10 days on standby and 5 hours of talk time.